How I came to learn about GTD, the ultimate compliment when I read the book. This lecture was my first experience with David Allen, and it left a mark on me. 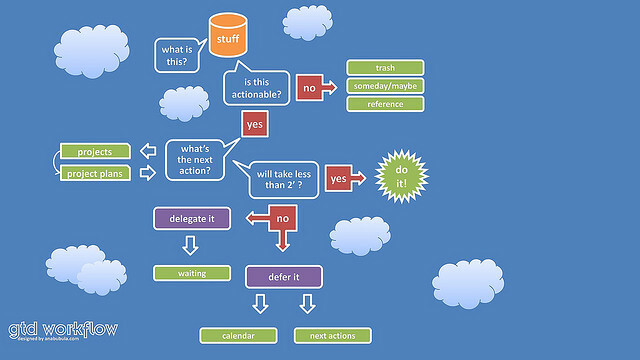 I’m very impressed with David Allen’s Getting Things Done (GTD) system. It’s very thorough, and I’ve borrowed practices over the past year which have helped me achieve this “mind like water” mindset at times. The premise of the system is that our brains are terrible at remembering information, and notorious for thinking of things you need to do at the worst possible time. It relies heavily on data capture, being meticulous with your next actionable steps list, and a thorough weekly review to keep things from falling off your plate. One drawback is that it is a time consuming process to set up initially, but my goal is to try this over the winter break. If yes, can it be done in 2 mins (do it then). Try to work a weekly review into your workflow; get into the ritual of methodically checking up on your To-Do list and calendar once a week. Think about the things that are bogging you down. Which quadrant do you see them in? How we can we devote more of our time and resources to Quadrant 2? This week, try to take a step back, and look at where you’re at a little more globally. Are you on the right path? Comment/Rate/Subscribe please! I’m trying to get the word out to as many students as possible and would love to expand my reach! Leaving a rating in iTunes will help with this greatly!